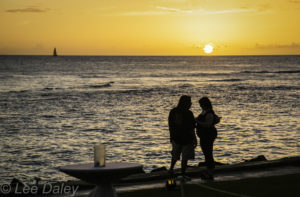 Escape to Kauai for Valentine’s Day, to an island where love reigns supreme. Caressed by warm tropical breezes, idyllic beaches, majestic canyons and cliffs and most of all, an incredibly warm Aloha spirit, Kauai embraces lovers like no other isle. One of my favorite Hawaiian myths tells us when Mother Nature swept over the Pacific Ocean in a burst of hormonal ecstasy more than 500 million years ago, she created that green pearl of love called Kauai and made it into a paradise for lovers. The island is small enough to explore over a long weekend while still leaving space for coveted cuddle time. 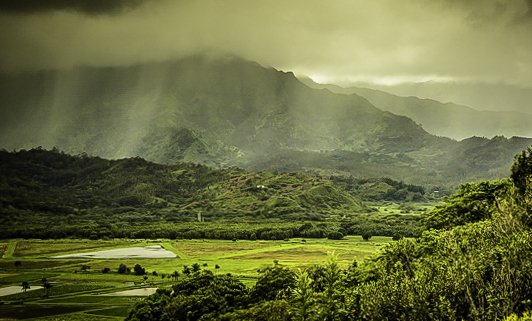 Locals cherish the beauty and serenity of Kauai. Lovers sense its aura of calm and kindness as it sets the stage for romance, not only on Valentine’s Day, but every day of the year. Where to Stay. The Garden Isle offers great diversity giving you a wide choice of where to stay and what to do during your romantic retreat. Wherever you stay, you’re merely a stroll from mile-long stretches of glittering sand beaches. Grand resorts, boutique hotels and more modestly priced bed and breakfast type accommodations are plentiful. Island cuisine is fresh and flavorful with farm-to-fork menus, fresh baked goodies and a plethora of eateries that run the gamut from roadside shacks and food trucks to five-star white-tablecloth dining. On my last visit, I stayed at the magnificent Westin Princeville Ocean Resort Villas on Kauai’s North Shore. An oasis of calm, this was where I captured rainbows rising over Hanalei Bay with its green mountainous backdrop, enjoyed haute cuisine in the Princeville’s fine dining restaurants and explored the local food truck casual lunch scene. Be sure and savor the sunsets at the Princeville Ocean Resort. Often the sunset watching is so attention-grabbing that you and your lover will find yourselves wrapped in the moment-holding your breath-as the blue of the sky and sea slowly warms to flame and clouds frame their edges in gold. Call it a “being in the moment” experience. 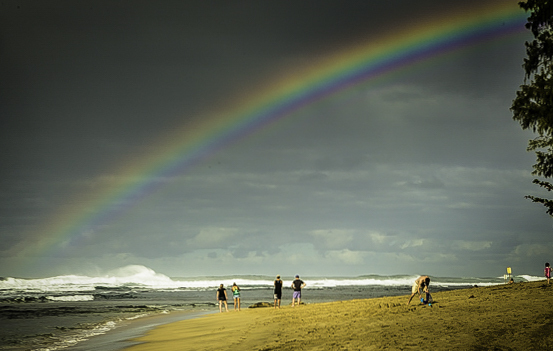 Poipu Beach: Named America’s best beach by the Travel Channel, Poipu Beach is actually a series of golden-sand crescents fronted by Poipu Beach Park. Tide pools to the east have been created by lava formations where tiny fish and hermit crabs abide. Protected by off-shore reefs and centrally located, it is an ideal spot to swim, surf, snorkel, sun bathe. Shipwreck Beach: Carry a camera to grab snapshots of surfers climbing waves at this local favorite. While pounding surf makes swimming a challenge, the trail head for Mahaulepu Trail starts here. If you are adventurous, this is a great hike with an opportunity to photograph and explore otherwise inaccessible coastline views. Baby Beach: Small, secluded and calm, this protected cove lends itself to tide-pooling and snorkeling. A rocky reef absorbs the energy of breaking surf before reaching the calm, crystal clear waters near the shoreline. Keep an eye out for monk seals and sea turtles. Romantics are welcome. Beach House Restaurant: Celebrate your love with another sunset watch from your beach-front table at the Beach House Restaurant overlooking spectacular Lawai Beach. This south shore favorite matches its romantic setting with generous Hawaiian hospitality and exquisite Pacific Rim cuisine. Be there before sunset where you will sit out on the open patio or at a cozy table and feel as though you are on the beach. The dining room is beautifully set with open full length windows affording unparalleled views and warm ocean breezes. This time of year you might bear witness to the mating migration of singing humpback whales who often pass by within sight of diners. Kauai embraces the senses like no other island. Because it is so small, you can drive from Princeville to Poipu in about an hour. So wherever you stay, make sure you explore all that the Garden Isle has to offer. Before you go, be sure and visit the official Kauai Visitors Bureau which offers a wealth of information and helpful tips. Tel: (808) 245-3971 Website: www.kauaidiscovery.com. The Westin Princeville Ocean Resort Villas is celebrating its 10th anniversary with a special package called Toast to Ten. Guests reserving the package can select from studio, one-bedroom or two-bedroom villa accommodations, and purchase a single five-course Journey Tasting Menu at the resort’s Nanea Restaurant and Bar with two glasses of sparkling wine at half-price. The package also includes a complimentary resort activity for two and a signature welcome amenity. The Toast to Ten package is available through December 31, 2018, with a minimum three-night stay required. Rates start at $380 per night for an island-view category studio villa. For more information or to make a reservation, visit www.westinprinceville.com, or call (866) 716-8140 and mention the package rate code LBPKG1. Click here for more articles by Lee.